In this post I will introduce the structure of the calendar. Unlike many other calendars, which have tried to adapt moon-cycles to fit a solar year, the Badí’ calendar establishes the month as a fixed unit of measurement within the year, every month being exactly nineteen days long. There are nineteen of these months in the year. The first month starts with the festival of Naw-Rúz and concludes with a month of fasting. Rather than using varying month lengths and leap years to keep the year’s length similar to the time it takes Earth to orbit the sun (365.256363004 days), the number of days required to bridge the difference between the days of the months (19 months x 19 days = 361 days) and the number of days between one Naw-Rúz and the next (ie. one solar year) are introduced as a festival (called Ayyam-i-Há) just before the month of fasting. While the start of this festival and the starts of the first eighteen months of the year are all calculated forward from the first day of the year in which they fall, the end of the festival and the start of the last month are both calculated backwards from the first day of the year they precede. Every month of the calendar is named after an attribute of God, and every day of the month is named using the same pattern. 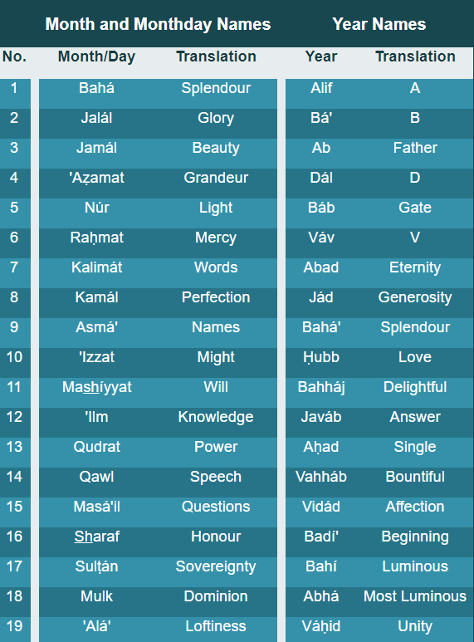 These attributes of God all originally appeared in an Islamic dawn prayer called The Du`á Sahar. 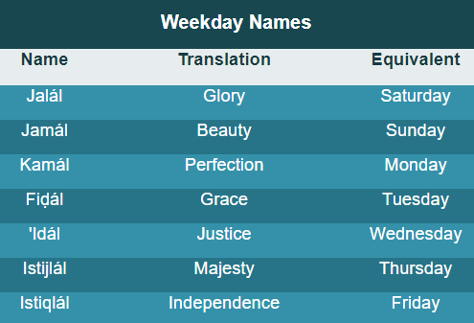 If it seems somewhat unusual to have month names with meanings it is probably because we have largely forgotten the significant meanings of most of the day and week names that we use today, the majority of which were named after Greek, Roman or Anglo-Saxon Gods. Cycles of 19 continue beyond the days and months in the Badí’ calendar, every 19 years are collectively called a Váhid (meaning unity). 19 Váhids are collectively called a Kull-i-Shay’ (meaning “All Things”), lasting for 361 years. Each year of a Váhid is also given its own name, we are currently in the year Ab (meaning Father), of the tenth Váhid, of the first Kull-i-Shay’. The names of the days, months and years in the Badí’ calendar. There is some numerology involved in the naming of the years, the numerical value of each Arabic year name is equal to the position of the year within the Váhid, the numerical value of “Váhid” itself being 19. In all three main languages of the world’s religions – Aramaic, Hebrew, and Arabic – 19 is also the numerical value of the word “one”. 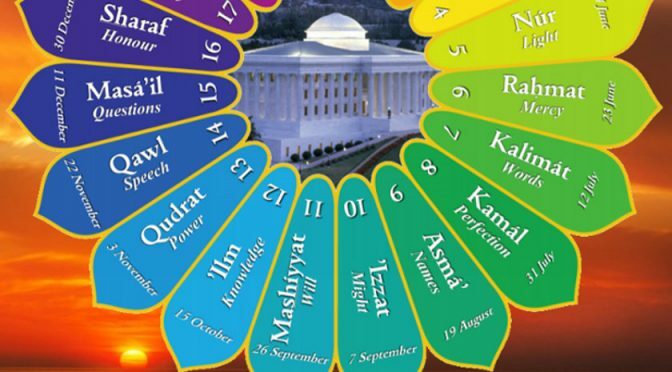 The 19-year cycle of the Váhid also represents the unity of the solar and lunar cycles. This period of time, called a metonic cycle in astronomy, is how long it takes for the sun, moon and Earth to return to the same alignment. In addition to naming each of the 19 days of the month, the Badí’ calendar still retains the 7 day week. Weekdays on the Badí’ calendar. Istiqlál, the 7th day of the week, is the day of rest on the Badí’ calendar. The “equivalent days” shown in the calendar are the Gregorian weekdays on which the Badí’ calendar days mainly fall, they do not align precisely because, as mentioned in a previous post, the Bahá’í day starts at sunset. Starting a day at sunset is another element of the Badí’ calendar which may seem odd to us, but it’s not a new concept. The traditional Hebrew and Islamic calendars both started their days at sunset, and the Liturgical Christian calendar day, observed in Monasteries, similarly starts in the evening. Some other religious groups who do not consider a day to last from one sunset to the next still consider their holy days to run from sunset to sunset or evening to evening. Historically, before clocks existed, it is thought that sunset may have been the most easily determined moment of the day, with sunrise being the second most easily recognised but for people being asleep for it. Using the Badí’ calendar, the full title of a date can be given in the form: “The day of [weekday name] , the day of [monthday name], of the month of [month name], of the year [year name], of the [Váhid number]st/nd/th Váhid of the [Kull-i-Shay number]st/nd/th Kull-i-Shay”. You might note that it is possible to refer to any day of a month within a 19 year period by names alone, without having to use a numerical reference, this is possible even without using the name of the weekday. In my next post on this subject, I expect to look more at the Ayyám-i-Há festival that sits between the last two months (Mulk and ‘Alá’) to complete the solar year, and at the other special days in the Bahá’í year.